Casino Comps: Risk Less, Get More! Casinos assume you will not be playing optimal basic strategy when gambling. Therefore they expect your loss-rate to be somewhere between 1% and 2%. For most blackjack players this assumption holds true. Hint: For the very best odds, find a table where the dealer Stands on Soft 17 (S17), you can double after splitting (DAS), re-split Aces (RSA) and surrender (LS). 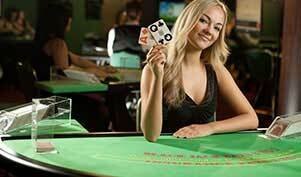 Most importantly, avoid any game where the blackjack payout is 6:5 rather than 3:2. Playing optimal basic strategy will put your losing rate much lower than what the house will assume for comp purposes. You might get comped as if you’re losing at a rate of 1% (.01) when in reality you’re playing basic strategy on a good game where the house edge is only around .2% (.002). Games like the Mirage double deck in Las Vegas have this small of a house edge if correct basic strategy is being played. Maybe you want to take a break for 15 minutes or so. Well don’t pick up your chips and get clocked out of the game, leave your chips at the table. This tactic keeps you clocked in as if you’re still playing. They’ll be comping you for time spent having a drink at the bar! When you leave a table you may want to pocket some chips and appear you lost more than you really did. This won’t change the formula they use to evaluate your comp level, but it could certainly sway a decision on whether or not you’re getting your room covered for the weekend. There are many strategies to increasing your comp value while risking less and these 6 tips should get you off to a great start. The overall concept is very simple. Look let you’re betting more, losing more and playing longer than you actually are. Use these tips and you can actually earn more in comps than the casino will ever get back from you at the tables.